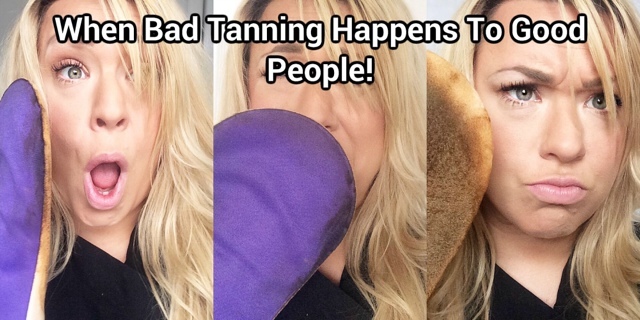 Lou Loves Beauty: When Bad Tanning Happens to Good People! If you've read my blog for a while you'll know that I love a bit of fake tan. Not a week goes by when I'm not tanned up and even in the winter months I'm still sporting a golden glow. Men, normally late 30-40's who've been on the beer and kebab diet since 1979, shirtless and in shorts as soon the temperature reaches above 15'C. Girls with orange patchy fake tan wondering around like they've just stepped off the beach in St Tropez when in reality they look like an extra for Charlie and the Chocolate Factory! Over the course of a couple of years I've learnt the hard way when it comes to achieving a flawless tan, and believe me there have been some major disasters! Unfortunately some people still haven't got to grips with the whole tanning thing, and at this time of year the problems seem to be getting worse! So I'm going to share my tips and tricks on achieving the perfect tan to stop this riffling epidemic from spreading!! When picking the right tan, always try and make sure they have a olive undertones, these are going to look the most natural and will reduce the chances on the dreaded Oompa Loompa tan! Don't run before you can walk! If you're a fake tan virgin pick a colour that will suit your skin tone. If you're super pale don't run out and get the darkest tan known to man , this will only end in disaster. Try Gradual tans first, these are a great way of building up the tan slowly and just give a hint of summertime glow. Always use a tanning mitt. I know its simple but orange palm are not, I repeat not attractive! Exfoliate, Exfoliate, Exfoliate. Want a nice even tan without the crocodile skin? Then you need to exfoliate. Its the most important step and will not only make your tan look better but will make it last longer. Try and exfoliate a day or two before you tan and then again when the tan is near to the end of its life, it will allow it to fade more evenly and also start prepping your skin for when you reapply. Mousse, Spray or Cream? This is personally preference, Cream based products tend to be more hydrating and moisturising, and the chances of the tan sticking to dry patches (if you haven't exfoliated) is less likely. Mousse tans are easy to apply and dry quickly allowing you to get dressed and not have to wait around with all your bits on show. Spray's are also quick drying and allow you to reach areas that are more difficult, but be careful when spraying in a confined spaces as the spray can tint tiles and objects in its firing line! Don't forget your ears! White ears and brown face is not a good look! And also don't forget to rubbed the tan into your hairline so there's no harsh lines, it will make the tan look more natural. Moisturise knees, feet, elbows, hands and any areas that are particularly dry. This will make the tan apply more smoothly and not stick to these areas, preventing streaking and patches. Continue to moisturise after the tan has been washed off to hydrate the skin and allow the tan to wear off evenly. Try and avoid oil based products, these can interfere with the tan and break it down making to more likely to fade quicker and become patchy. Had a tanning disaster? To get rid of unwanted streaks or if the tanning mitt has had a malfunction use whitening toothpaste or a fake tan remover, this will get rid of the marks and allow you to continued your streak free day. Want to tan before going on holiday? Great idea, but be warned. The chlorine in that gorgeous swimming pool will remove that tan before you've had chance to order your first pina colada! Use Vaseline on cuticles and eyebrows to prevent them staining. What are you tips and tricks for achieving a flawless fake tan?